PS: Interestingly, #4 & #2 seem to use @constantcontact email marketing software - indicating a tight integration between their email marketing & social media efforts. Way to go. Established only in 2010, this Filipino eatery has risen very fast to reach more than 3600 followers. They tweet often about their events, specials, current location & also use hashtags rather well. This high end restaurant and wine bar not only tweets about what happening in its own business, but also leverages current happenings in their tweets (The Hangover - 2, for example). 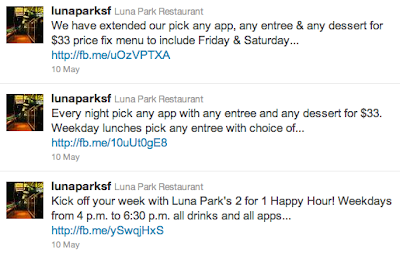 The Luna Park Restaurant is proof that it pays to keep your social media strategy simple and interconnected. They put up events on Facebook & tweet about them on twitter. An interesting Tweet-a-day keeps your followers happy. Slightglass' tweets are a mix of events, pictures and quirky tweets like the one below. This restaurant smells like ham in most of its tweets! With interesting pictures and posts they have their twitter strategy - well thought and hand crafted. Miles Davis' 85th Birthday? A good excuse to head out to Yoshis. Interesting Jazz events (like http://conta.cc/iJF5xB) are a cornerstone of their tweet content. Sometimes, it's not what you say, but how you say it that matters! The 21st Amendement uses twitter for the same things most local businesses do, but their tweets have a nice way of engaging people, as the tweet below shows. Wow! Though it's not always about numbers, with more than 300 thousand followers, this ice cream place rocks on twitter. Besides mentioning their interesting flavors on offer, they do 'the usual' - reply promptly and announce specials & events at regular intervals. Kudos to San Francisco's No: 1 eatery on Twitter.